I have our entire house decorated for fall now, but getting it all photographed for my blog is a whole other story! My husband and I were walking out the door to the grocery store Sunday, when I noticed a bank of clouds moving towards the North End. I said, "Sorry, Honey, but I've got to get some photos before the sun goes away!" I threw my purse aside and ran for my camera! He's such a good sport. He went back to his man cave and watched football until the clouds made it too dark to shoot, then we went grocery shopping. I only managed to photograph the living room, so that's what's on the menu for today. It's been rainy, windy, and dark outside since then, so I'm glad I ran for my camera when I had the chance. Our fall decor is fairly muted this year in the living room compared to the bright jewel tones from last year. Our furniture arrangement in here is new and, while we're not in a big hurry, we are on the lookout for another upholstered chair. Our living room windows are small and spaced oddly because this used to be two smaller rooms until a wall was removed way before our time here. So, I kind of throw out all the rules and place the furniture where ever it best suits our family gatherings. When we ordered our leather reading chair last year, we got to choose two throw pillows with it. I chose these brown plaid ones because I thought they'd be great on the sofa for fall and tie in the dark brown of the chair with the beige sofa. I've always loved plaids. The brown velvet pillow adds a plush warm sumptuous texture. We've had the large sunflower Monet print from Pier One Imports for about twenty years. It was the first art I bought for the living room. It's very big and heavy and takes two of us to hang it, but the scale seemed right for this twenty-three foot long room with ten and a half foot tall ceilings. 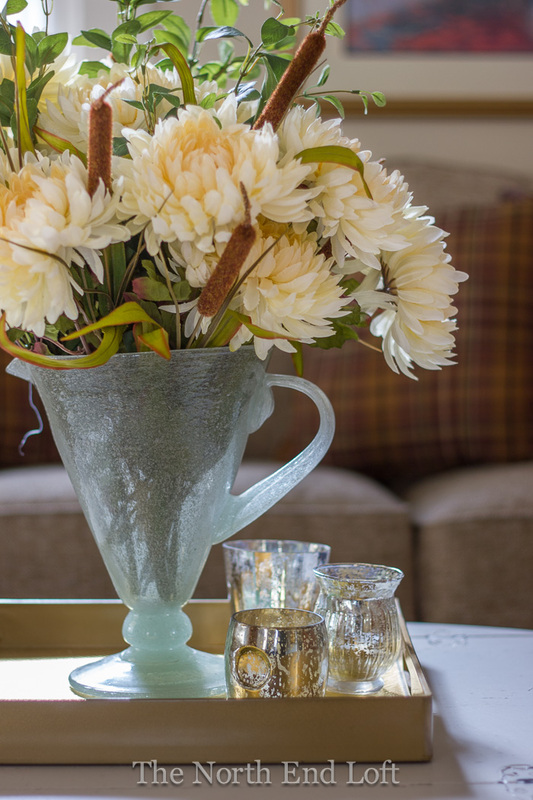 These pretty stems are new this fall from the craft store. 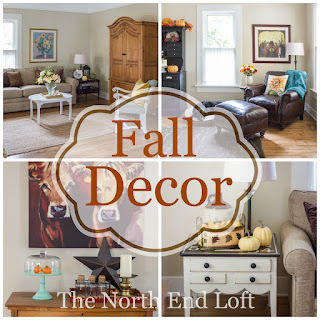 I purchased very little this year for fall decorating because I already have a big collection of items to use, and everything looks new to me anyway when its used in different ways for the different seasons. This big glass pitcher I'm using for a vase was my mother's. The glass is full of tiny bubbles. While we decide on a new coffee table, we brought this one (found for free on the side of the road years ago) in from the front porch. This little green snippet of ivy has a story behind it. When my mother passed away in 1984, my brother took her ivy plant home to live with him. When I was visiting him in California for his retirement party in 2009, he gave me a cutting from that plant, and I flew home with it in a baggie wrapped in a damp paper towel. I'm terrible at keeping house plants alive, so when the little cutting had about one shriveled leaf left on it, my daughter took it to live at her home here in Boise. Over the summer, she gave me another cutting from her now big healthy plant, and if you look closely, you can just see a few new leaves starting. I found a place in my home it does well, and my cutting is thriving. (The trick seems to be forgetting to water it!) Every time I see my little plant in this clay pot with the angels on it, I think of my mother and how her ivy is still here with us after thirty-one years, growing happily in the homes of her children and grandchildren. 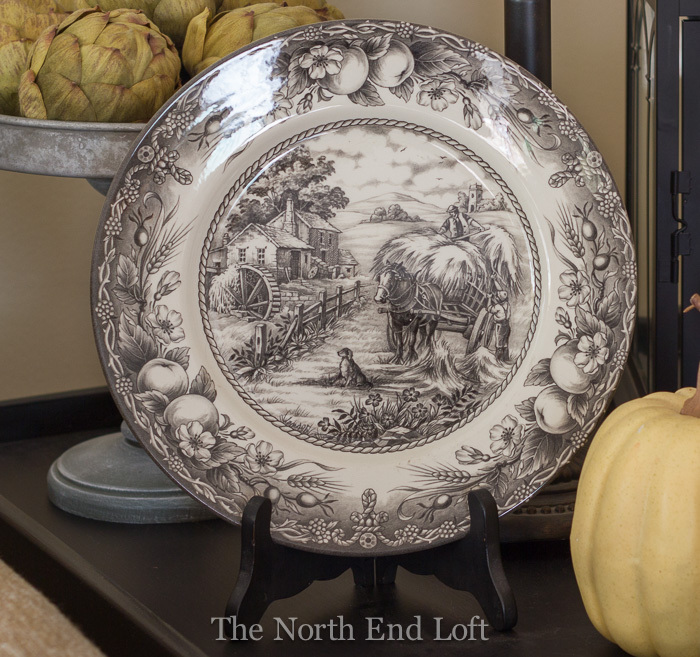 I found this black and white harvest patterned plate years ago at my favorite Red Lodge, Montana store, Kibler and Kirch. 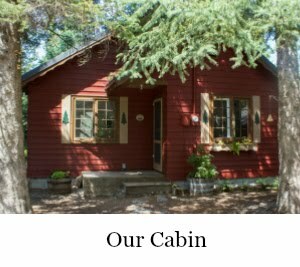 Whenever we visit family in Red Lodge, I spend an hour or two browsing this wonderful design store that furnishes some of the most beautiful cabins in Montana. I always pick out one small item to take home. On another visit there, I found these realistic faux artichokes. 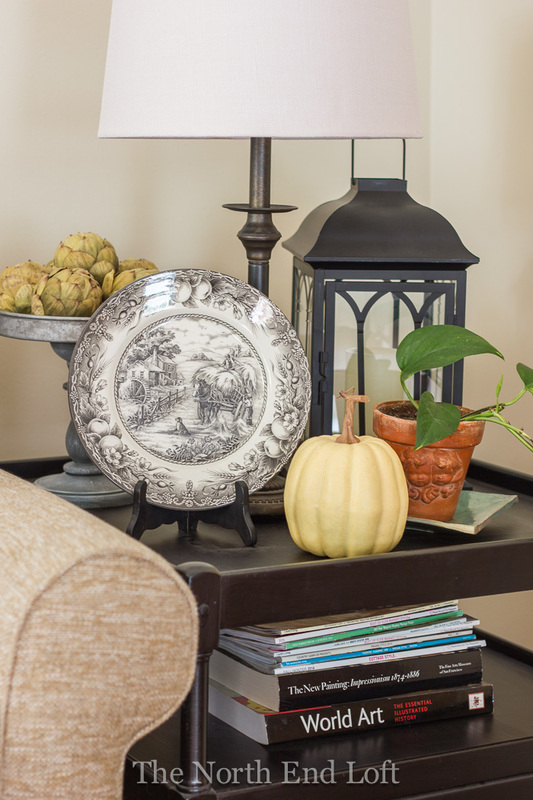 This old brown and cream jug belonged to my mother in-law, and it's just the perfect thing for a fall farmhouse vignette atop my graphic painted end table. 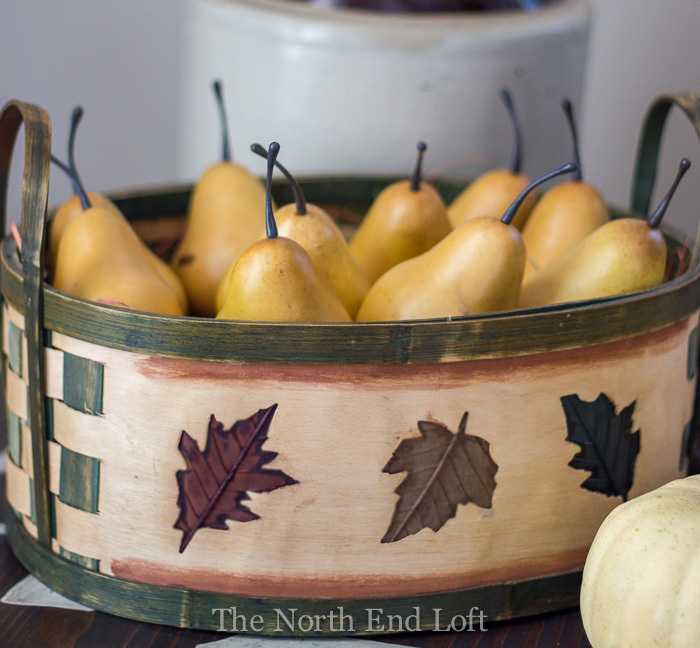 A wood basket with slats woven into the ends and fall leaves carved onto the sides holds some faux pears. 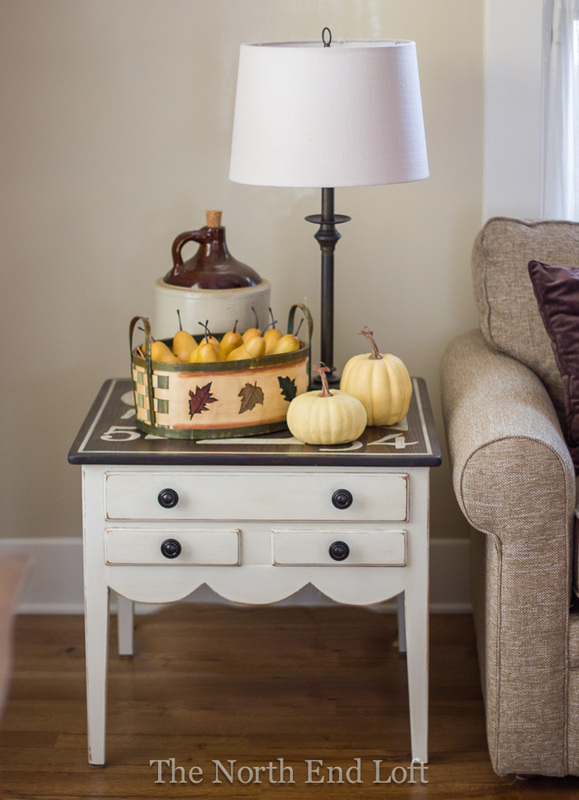 The gold color on the pears and pumpkins is repeated on the chair pillows and the gold tray on the coffee table. This is the chair I painted, upholstery and all, for my daughter's bedroom. 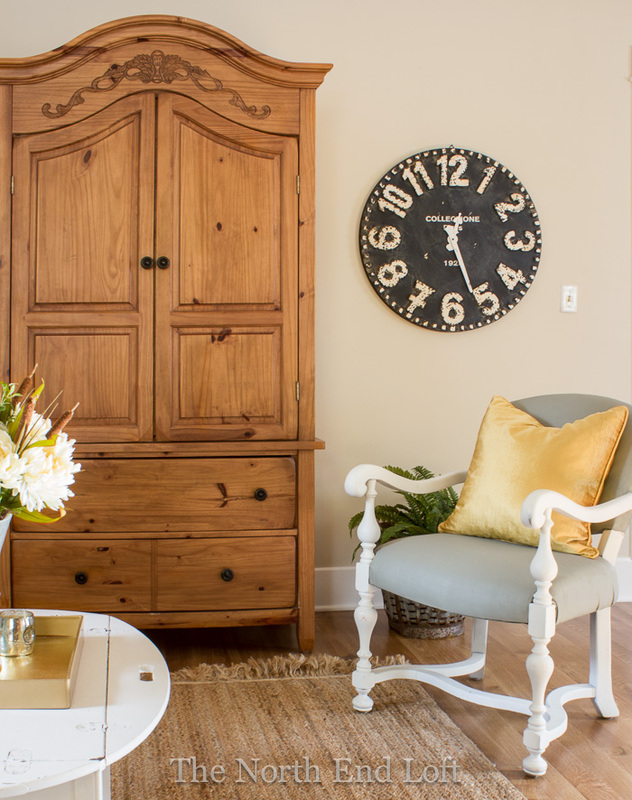 I love the soft glow of light the gold accents add to this room. The other side of our long living room has a lot of brown in it, and you can see why I wanted the brown pillows over on the sofa to tie them together. The sunflower pillow is new this year, a coupon steal from the craft store, and the honeycomb vase was a discount store find. I just love Tucker's company when I'm taking photos. He's my best bud and definitely my favorite decoration. Above the leather reading chair hangs a framed print of my favorite Diego Rivera painting. 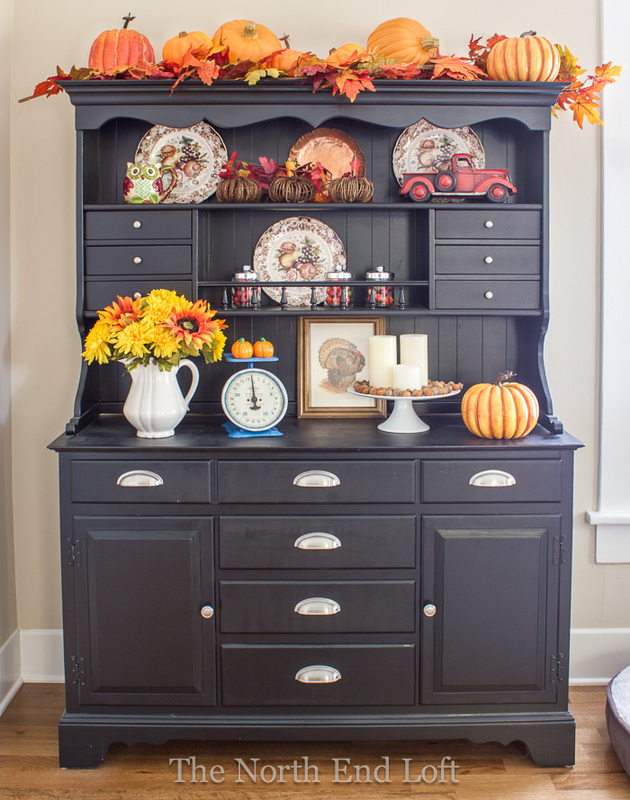 I really poured on the fall color over here, and the hutch is the fun seasonal focal point of the house. I found this handsome Tom turkey art print at the Biodiversity Heritage Library. Isn't he gorgeous? I just love my cows. I feel like they're always waiting for me to walk into the room, and they always make me smile. 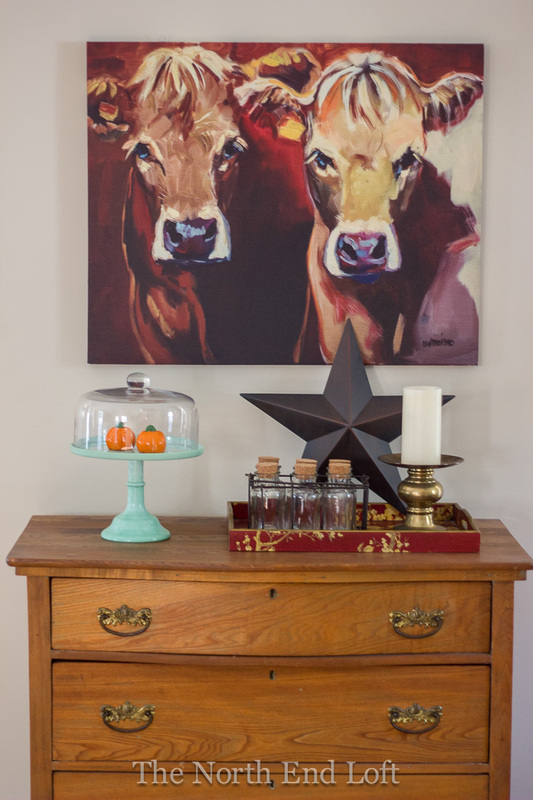 The last new item I purchased this fall is the green cake stand from The Pioneer Woman's new collection. 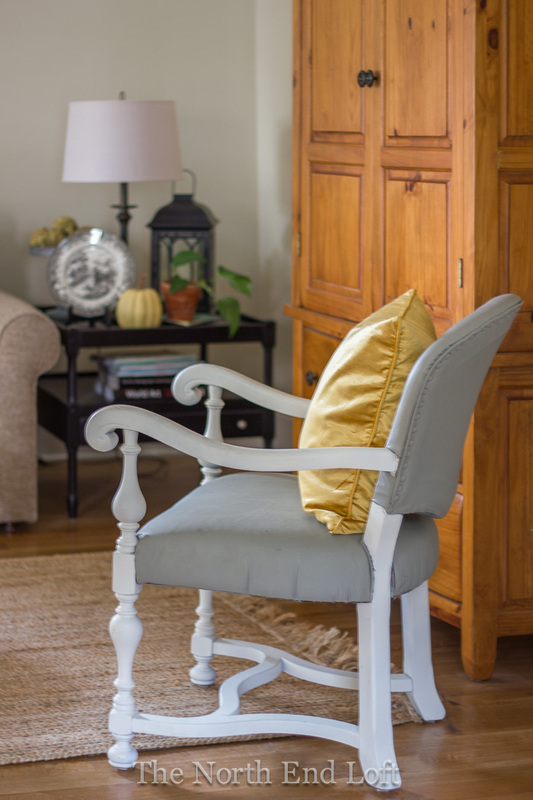 Having a cake stand here on the old antique dresser in the living room may seem a bit odd, but it sort of describes the design style that I've fallen into without really thinking about it. 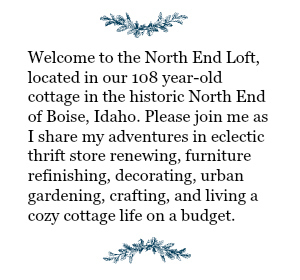 You see, my husband and I only have things in our home that we really love and that are personally meaningful to us. It's taken a lifetime of collecting and weeding out and learning what we like, and when that's the case, when you love everything you have, it really doesn't matter where or how or in which room it goes. We love it all, and it just work for us. 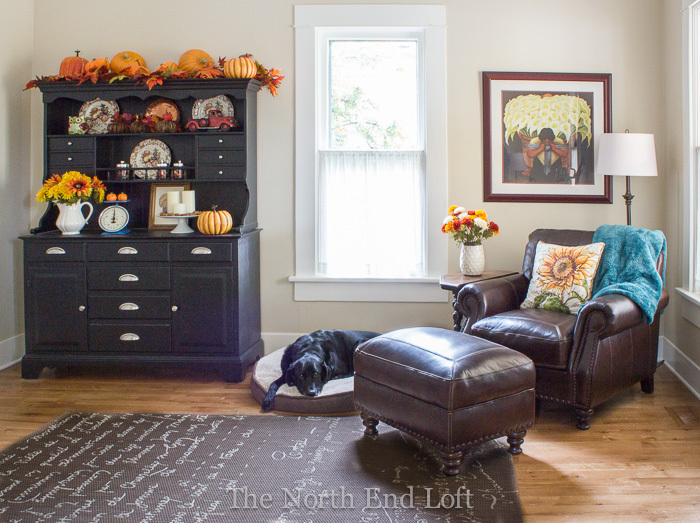 I hope you enjoyed this year's eclectic fall living room decor - our mishmash of the things we love. 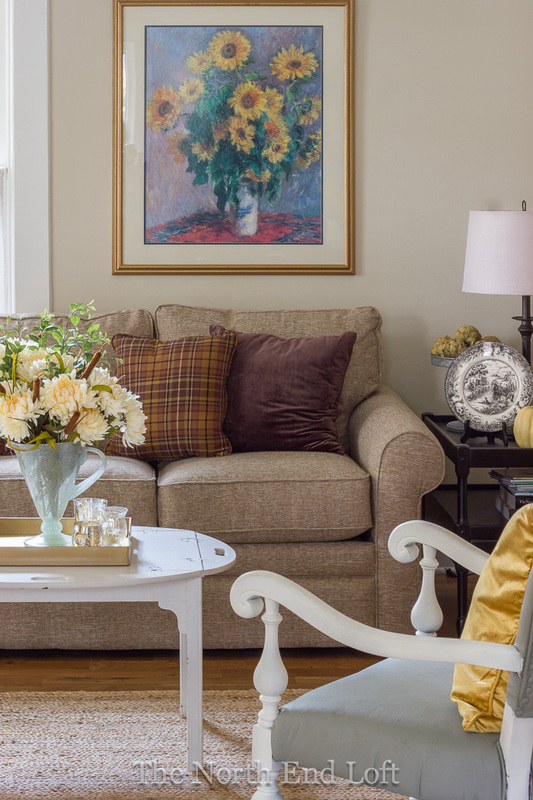 For last year's colorful fall home tour, just click here. And please come on back and check out what's up in the family room next week. I'll be grabbing my camera again just as soon as the clouds take a break. And now, it's party time! I love how you decorated. It looks so warm and welcome. 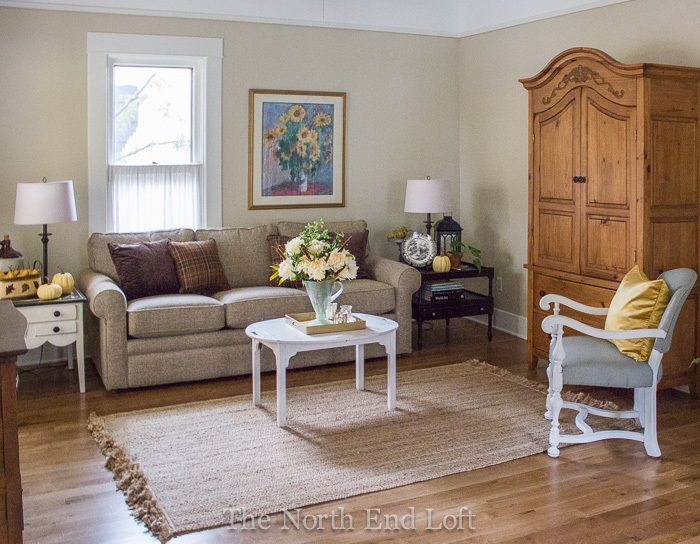 What a beautiful and inviting space! I love the pops of fall colour - so gorgeous! I know what you mean about grabbing shots before it gets to dark inside. I haven't been able to take decent shots for the past eleven day due to clouds and rain. The sun returned today and immediately I started taking pictures. 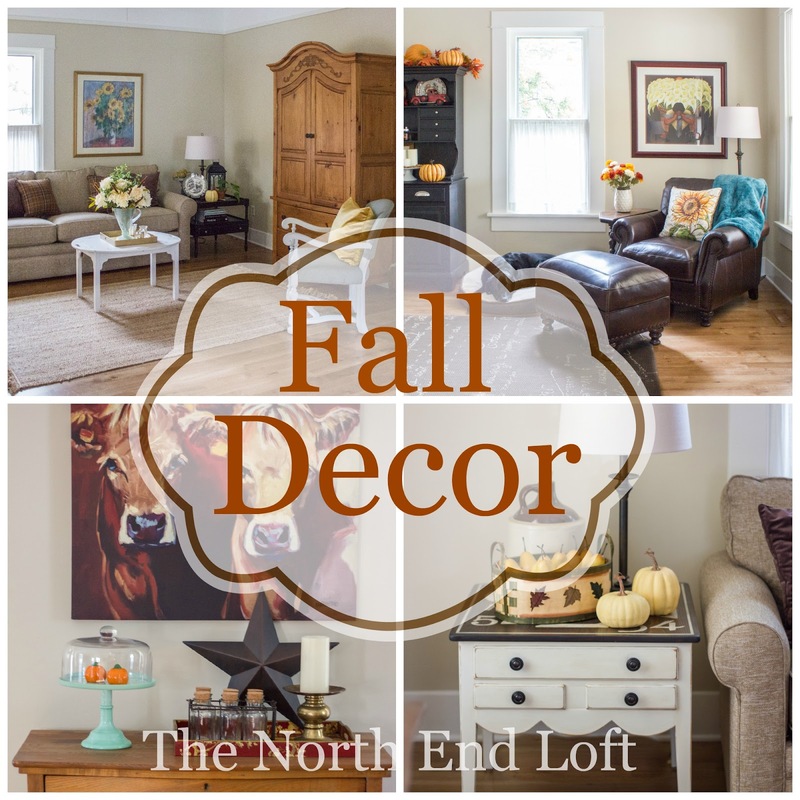 Your home looks so good dressed for fall. I hear ya on lack of sunshine - it seems either it's perfect and I am not home, or home and perfect but have company coming, or I have time, no company and it is perfectly sunny and I have to work, or now, today being a good day to take a fall home tour pictorial - rained and gloomy all day. I give up. It's nearly too late and the house looks so nice to share. Ugh. ANYway, yours looks amazing, love its simple and well-thought-out design. Well done, Laurel! Everything looks lovely for fall. 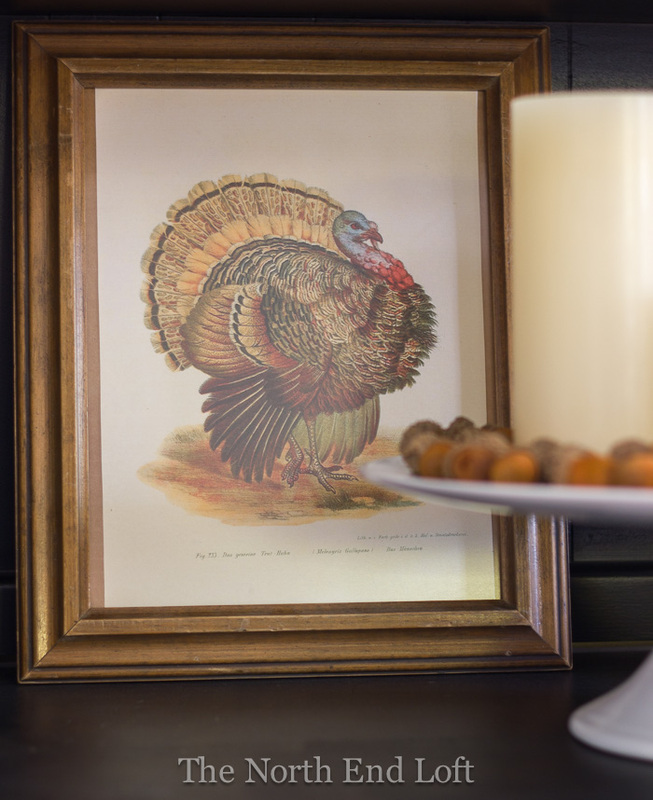 Your home is so very, very beautifully dressed for Fall...I am loving so many of the wonderful details you have incorporated such as that great turkey print. It has been pretty gloomy and cloudy around here...but finally the sun is shining and the camera is in use!....Have a wonderful week! 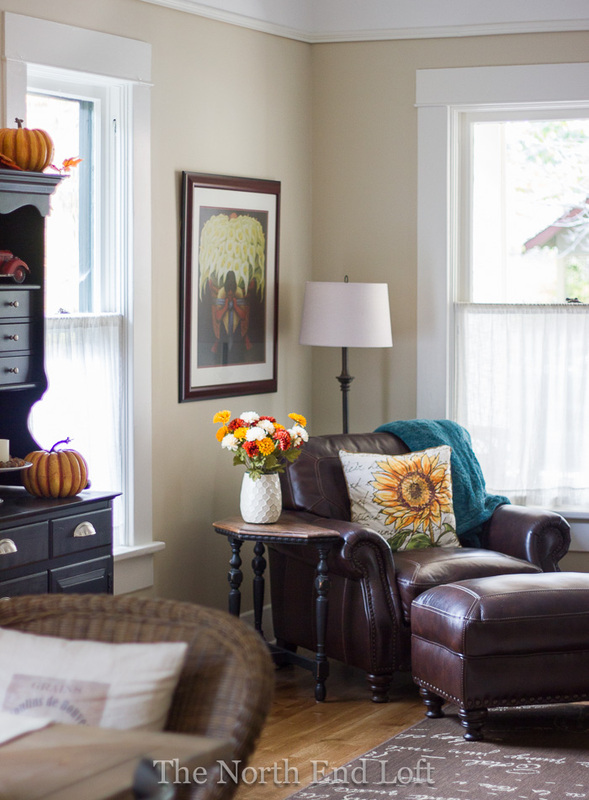 Your living room looks beautiful all dressed for Fall. I love the story behind the Ivy. What a special thing to have. 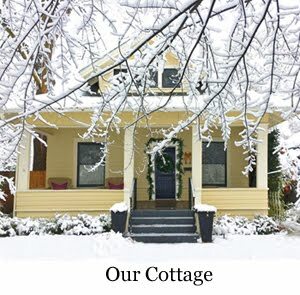 Your home is so lovely!! I adore your soft color palette within your living room for Autumn, dear one!!! The hutch filled with PoPs of orange and texture is stunning!!! 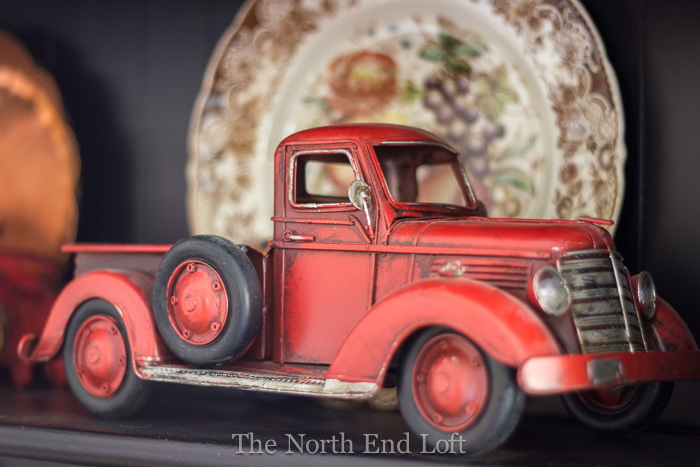 L o v e the red truck!!! I had an enjoyable read! 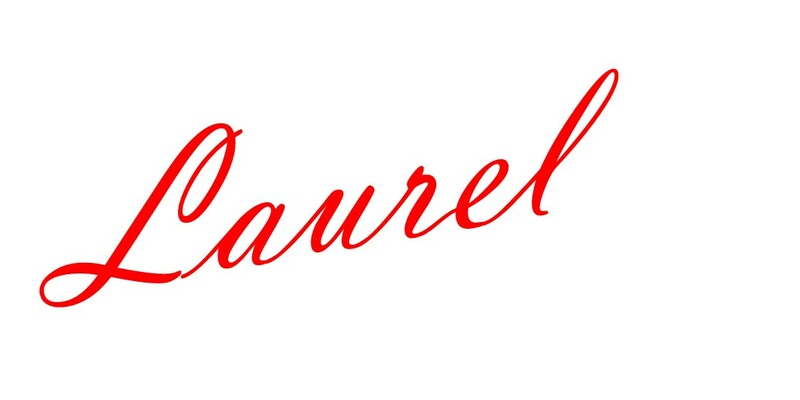 Great post Laurel! You can decorate so beautifully.